Now for the wildly anticipated 'All Purpose Room' installment of the Paula's Place: A Phone-A-Friend Mini-Series! I would like to make the little den (with small leather sofa) an APR (All Purpose Room).. but, mostly for the lil one to play.. since we're always on the floor, I'm looking for floor pillows that are both kidsy, but sophisticated! Love this pattern. 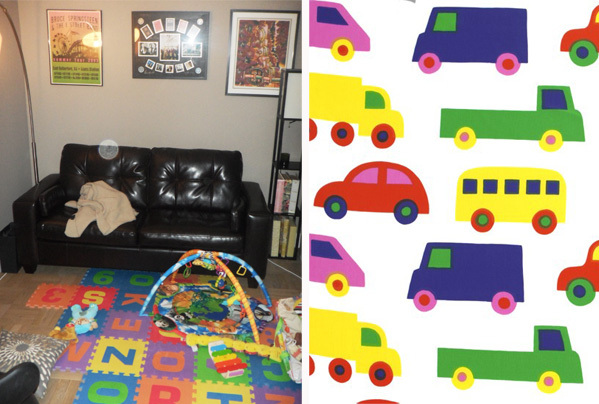 Here's the lil' den and Paula's fave fabric from OUR fave Marimekko. Since neither of us have APRs, or kids for that matter, we trolled the interwebs (read: pinterest) for some inspiration. Below are a few pictures that piqued our interest because they are kid friendly, AND we feel like an adult could spend time in these rooms without wanting to poke their eyes out. Who doesn't want to hang out with a giant slumbering teddy bear? 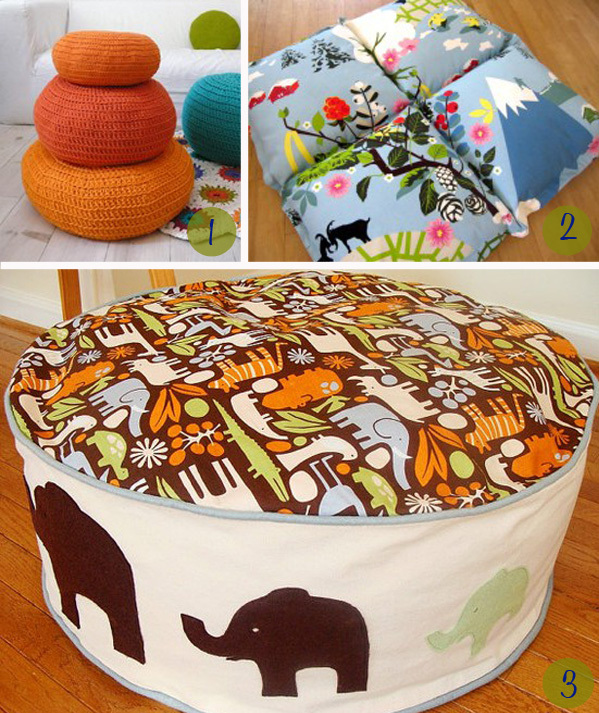 Paula mentioned in her email that she is looking for some great 'kidsy' floor pillows. Below are a few options that we think are kidsy AND sophisticated. You can chose a pattern you like, and then mix in coordinating solid colors in different shapes and sizes. Paula, you can also buy the Marimekko fabric you love and send it to this etsy retailer and have her make custom floor cushions. SUWHEET! And for a more sophisticated option, we chose some fun graphic floor pillows that are on trend, but also great patterns and shapes for le kiddos. They acutally kinda remind of us our favorite Wee Gallery art cards. 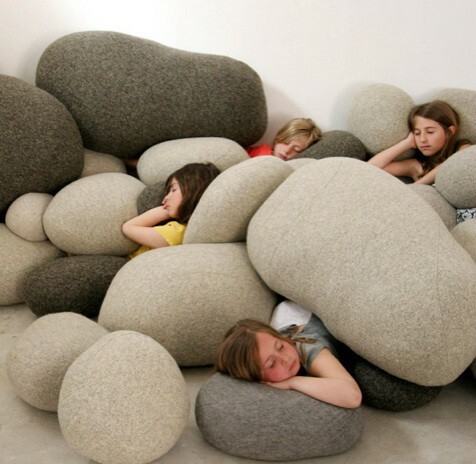 And now a question for our readers: Are these stone/rock pillows the coolest or ugliest thing you've ever seen? We're stumped. Now go out and buy some cute elastic-waist-band pants... Turkey Day is just around the corner! I just want to permanently live in the room in that first photo - so cozy! Totally agree! I love it. And in my younger years I would describe that room as the perfect place to make up a dance to a Paula Abdul song in.